Elegant Concord Plan with Hardwoods Throughout and Amazing Greenbelt View! Upon entering, the study is just off the foyer. 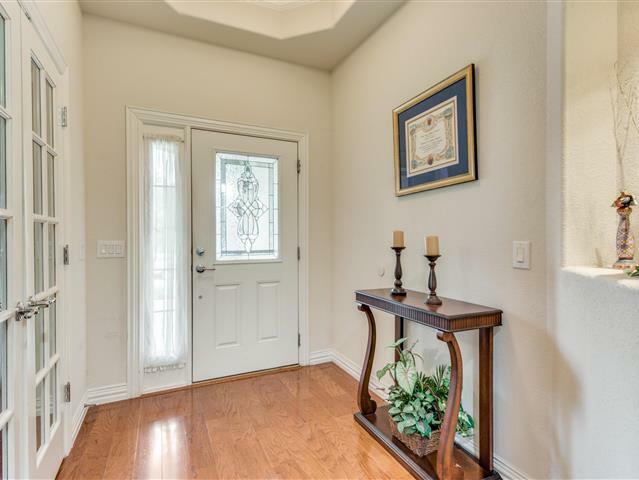 French doors lead to a spacious study with a decorative coffered ceiling. Formal dining room is enhanced by the chair rail design and trey ceiling. Kitchen features granite counters, convection oven and gas cooktop. The large family room boasts a gas, brick fireplace with a molding detail over the mantel. Sunroom overlooks a peaceful greenbelt and an entertainer's stamped-concrete patio with built-in outdoor kitchen. Master suite is large enough for a sitting area, and the ensuite bathroom provides separate vanities, garden tub & tiled shower. Zero-fee loan available on this listing.